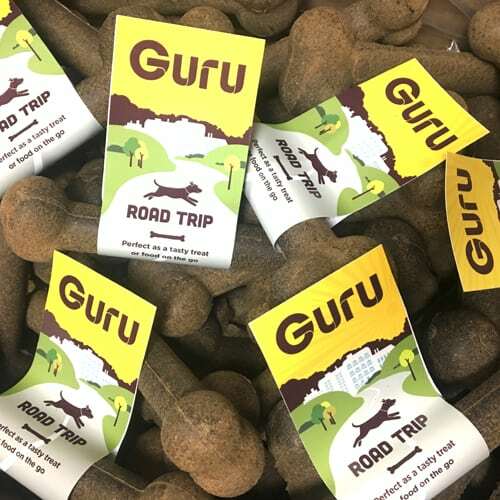 Get 10 Road Trip bones for £28.00 £24.00! We believe that your four legged friend deserves natural food full of natural ingredients. That’s why we’ve created the most delicious cold pressed dog treat for your canine companion to enjoy! 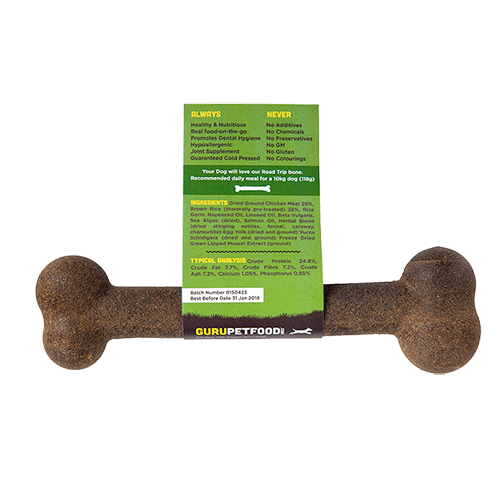 These tasty dog bones are full of flavour using chicken and a variety of natural ingredients to ensure your dog stays happy and healthy. Perfect for dogs that are larger than life, and for smaller mouths why not try our small and tasty chicken bones? Treat your four legged friend mid walk or just because you can! Whenever you like to treat your dog, choose Guru Pet Food to make their day. Ingredients: Dried Ground Chicken Meat 28% Brown Rice (thermally pre-treated) 28%, Rice Germ, Rapeseed Oil, Linseed Oil, Beta Vulgaris, Sea Algae (dried), Salmon Oil, Herbal Blend (dried stinging nettles, fennel, caraway, chamomile) Egg Yolk (dried and ground) Yucca Schidigera (dried and ground) Freeze Dried Green Lipped Mussel Extract (ground).